3 Beds 1 / 1 / 0 Bath 1,470 Sq. ft. 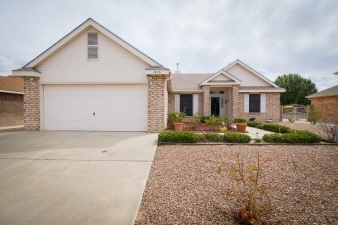 Description: A sivage thomas brick beauty located in one of los lunas most popular and beautifully maintained subdivisions. Los cerritos de los lunas is located only minutes from i-25, west of los lunas high school, and seconds from stores, popular restaurants & movie theater. This home features 3 bedrooms, 1-3/4 baths, cathedral ceilings & a split bedroom design. Relax and enjoy cozy nights by the gas-log fireplace and refrigerated air conditioning will keep you cool all summer long. Seller says refrigerator, washer & dryer stay. The raised block wall gives extra privacy for relaxation on the backyard patio. Roof was replaced 2 years ago. Easy-car landscape has auto sprinklers & beautiful fruit trees. Storage shed and 2-car attached garage. Come see this beauty in this fabulous neighborhood!